Prime Minister Theresa May faced the media on Thursday evening despite a day which saw seven resign, including Brexit Secretary Dominic Raab and Work and Pensions Secretary Esther McVey. Mrs May defended her proposed EU Withdrawal Agreement as “the right one for our country”, before answering questions. The Prime Minister has said that she will see Brexit through, despite the threat of a no confidence vote against her. "Leadership is about taking the right decisions, not the easy ones," she said. "As Prime Minister my job is to bring back a deal that delivers on the vote of the British people, that does that by ending free movement, all the things I raised in my statement, ending free movement, ensuring we are not sending vast annual sums to the EU any longer, ending the jurisdiction of the European Court of Justice, but also protects jobs and protects people's livelihoods, protects our security, protects the Union of the United Kingdom. Mrs May described her proposed agreement as “the right one for our country”. The Brexit negotiations are "a matter of the highest consequence", she said, touching "almost every area of our national life". She added: "I believe with every fibre of my being that the course I have set out is the right one for our country and all our people. "From the very beginning I have known what I wanted to deliver for the British people to honour their vote in the referendum." Mrs May acknowledged the agreement had involved "difficult and sometimes uncomfortable decisions". "I understand fully that there are some who are unhappy with those compromises but this deal delivers what people voted for and it is in the national interest," she said. The Prime Minister went on to praise Michael Gove, who has been rumoured to be considering following other ministers in resigning, for his work at DEFRA but confirmed she had not yet appointed a new Dexeu Secretary. She said: "Michael has done an excellent job at DEFRA, particularly in his defence of the fishing industry. "There are some very important elements of the outline political declaration which recognise the UK will be an Independent Coastal State in the future. "Fishing is an issue that matters to people and Michael has been doing an excellent job in ensuring we are delivering on that commitment that we have to come out of the Common Fisheries Policy. "I have not yet appointed a new Department for Exiting the European Union Secretary yet and I will of course be making appointments to the Government in due course." 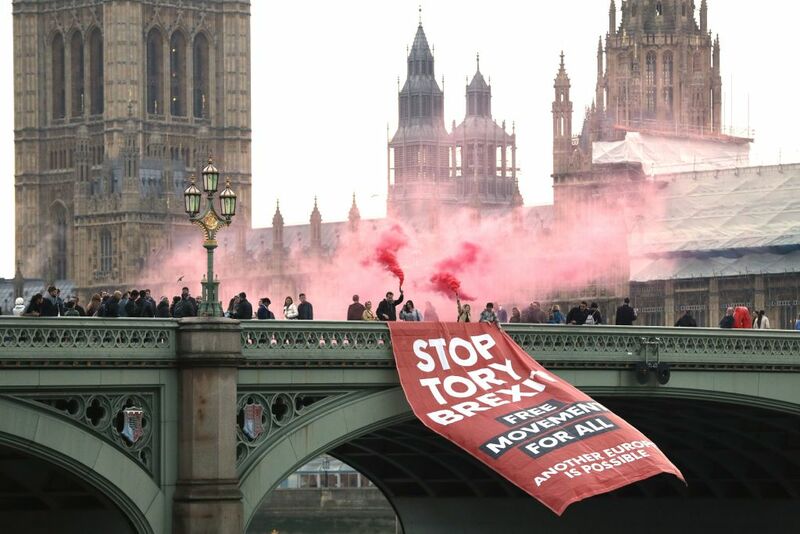 Protesters on Westminster Bridge on Thursday afternoon calling for an end to Brexit. The Prime Minister also took the opportunity to reiterate that a second EU referendum was not an option. “There were a number of Members of Parliament who stood up in the House of Commons today and said that their view was staying in the EU was the right thing to do,” she said. “I disagree. We gave the vote to the British people, Parliament overwhelming gave that vote to the British people to decide whether or not to stay in the European Union. Mrs May likened her determination to stick to her course to her cricketing hero - former England batsman Geoffrey Boycott. "What do you know about Geoffrey Boycott? Geoffrey Boycott stuck to it and he got the runs in the end," she said.